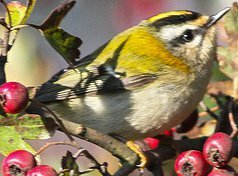 Note the white stripe above the eye, the black stripe through the eye and the flash of yellow on the sides of the neck which easily distinguishes it from the Goldcrest. Otherwise it is a similar shape and size. The juvenile bird lacks the black and yellow markings on the crown but still shows the black and white eye stripes and wing bars. An uncommon resident Breeder in the south coast area of the UK where there are around 600 pair. Numbers can increase in the winter due to migrants. Found throughout Southern Europe down to Africa. Found in mixed woodland with no particular preference although appears to prefer to nest in conifers. The male and female adult birds are very similar and are one of the brightest, colourful European birds. 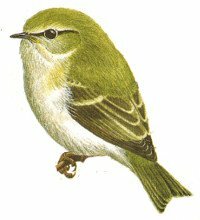 Closely related to the Goldcrest it is not unknown for cross breeding to take place. Firecrests are restless birds, rarely still, and constantly flitting from branch to branch, often hanging upside down to get at insects.